Good / Bad – Right / Wrong – Crime / Law – and Lau / Chen. All these aspects are explored in Internal Affairs, brought to you by Directors: Wai-Keung Lau and Alan Mak; plus Actors Andy Lau and Tony Wai. It was made in 2002, and has a running time of 101 minutes. A gangster becomes a cop, and a cop becomes a gangster, both sides playing the same game of justice enveloped within their own shadow. The gangster turned cop, Lau Ming (Andy Lau), done so under the supervision of the crime boss Hon Sam. And the cop that became a gangster, Chen Yan (Tony Wai), done so under the supervision of police Inspector Cheung. Three years later, the same game is being played, with Lau higher up the ranks in the police division, and Chen finally reaching the employee of Hon Sam. By chance, these two diametrically opposed people meet up at a stereo store, where Chen sales Lau a stereo. Still, this is nothing more that a footnote of what happens next, as both Chen and Lau are used as pawns by their respective superiors, to avoid / deter capture during a drug deal. However, the outcome of this dubious venture signals to both Inspector Cheung and Hon Sam that there is a traitor within there mist, prompting them both to get their respective undercover operatives, Lau and Chen, to look more closely in this matter. Strangely, though, Lau has the upper hand in this ploy - as he is promoted to head a special internal affairs task force, so that he can find out who is the spy within the police side of the proceedings (so the spy is looking for himself). And not only that, but in addition to this, Lau gets Hon to obtain from his men their personal details, so that he can also check up on them as well (playing both sides of the same coin as it where). Now the next time that Lau and Chen meet - they don’t. It’s just after Hon gives Lau the personal details he asked for (containing the word ‘bodyguard’ inscribed upon the envelope by Chen), in which both men avoid each others glances in case they get noticed. But does anything come out of this information? No - not for Lau - except that he then turns turns his attention to the man behind the undercover cop, Inspector Cheung, and orders a policeman to trail him as if it was part of his investigations. This ploy works - resulting in ;Chen managing to get away – whilst Inspector Cheung, not, and dies, SPLAT! Reeling from this death, Chen eventually gets to talks to Lau upon the dead Inspectors phone, and persuades him to help him get back at Hon for the Inspectors death – Lau does – and so does Chen too, BANG! Bye-bye Hon San. Next, in the aftermath of this success, Chen and Lau finally meet face to face back at police headquarters. Chen wants his life back, and Lau is willing to give it back to him. Though does this work out? Does the gangster stay a cop? And does the cop turn his back on his gangster status? Or maybe something else comes into play? Something unexpected? And that is why what next transpires, is dangerous, dramatic, stark, and somewhat foreboding, because policemen fall - criminals rise - and the state of Internal Affairs is never the same again. 'Infernal Affairs' is the Hong Kong movie that famed film director, Martin Scorsese, adapted into his movie ‘The Departed’ – and I have to say that Mr. Scorsese does have very good taste. Now the reason why I say this, is because this well made film is just a blast from start to finish. Is is a captivating suspense filled film, it is full of subterfuge, it is full of mystery, and is has a dynamic plot to boot. Granted, in places I understood where the story was going - as I did watch 'The Departed' before I watched this film. But it did divert in places as well, whist presenting a similar frame work in a different way. One minute? This film came first! So I suppose that this should be told the other way round? Right? Boy, what a dichotomy! Just like this film. Well, let’s face it, that is what this film is – an entity – one which tells a tale of two sides of the same coin, and how this bi-polar situation can either hinder you, or help you. 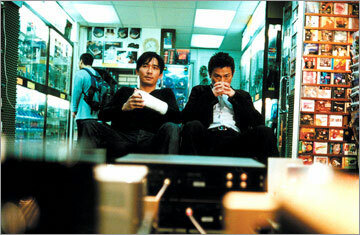 And trust me my fellow readers, this film will help you see Hong Kong cinema in a new light. It’s not a Kung Fu flick – it’s not a badly dubbed sword play film between two dodgy geezers with two dodgy moustaches – it’s a film that the great Martin Scorsese himself, wanted to remake into his own image. Personally speaking, I though that this crime story was just great - as it kept me at the edge of my seat from start to finish. I can't fault it - I can't praise it enough - and I recommend anyone to pick one up today - because it is a must see film for anyone who likes their crime with an oriental flair.